Your home is meant to be a peaceful place where you can relax and unwind in comfort, the last thing you want is to feel uneasy or worried in your home. Which is why we’ve written this article on how you can improve security within your home. Why Should I Improve Security Of My Home? No matter where you live it is always a possibility that you could be the unfortunate victim of a burglary, no matter where your home is somebody could always be waiting for you to go out for the day before they make off with your belongings. Family heirlooms and objects from your childhood are original and irreplaceable, stuff like this may have great value and could be the target of a burglar – things like an expensive necklace that your grandma gifted you years ago. So it’s important to protect the irreplaceable. Not only should you improve your home security to protect your belongings, but to protect your family or anybody that may live with you. The likelihood is that if you come home and find someone in your home attempting to steal your belongings that they are going to react aggressively and someone could end up injured. Therefore it’s essential that you pull out all the stops to ensure that your home is practically untouchable. We’ve written this article giving some top tips on how you can improve your homes security and how to keep burglars and robbers at bay. The point of ensuring that your home is inaccessible is to make sure that nobody can access your personal belongings; things like money, jewellery, important documents, cheques or anything you treasure. By having a safe, you are able to store all of your most treasured possessions and leave them at home daily without having the worry of them being stolen or broken. The other benefits of having a safe in your home are that you can purchase safes that do not look like safes, these are perfect for your home as burglars will not be able to locate any of the valuables hidden within your safe. Home security systems have advanced majorly since first being discovered, they are now available in more complex forms and are able to detect intruders better than ever before. The most common form of home security, this system alerts a call centre if it detects an intruder – who then contact the police. When this system senses an intruder, it will immediately set off a loud alarm. However, this system relies on your neighbours hearing the siren and calling the police. The loud noise of a siren often startles burglars and scares them away. Wireless systems can be used with either sensors, cameras, beams or motion detectors. Monitors windows and doors, this mechanism will send out a small beep when either a window or door is opened. You can choose one of these security devices based on the layout of your home or your personal preferences. Another popular upcoming form of home security is CCTV cameras; security cameras are small video cameras that are also used in places such as shops and busy establishments so that if anyone attempts to steal they’re caught on camera. In most cases a burglar or intruder won’t even attempt to enter your home if they have noticed a security camera, this is often why shops display signs saying things such as “Smile you’re on camera”. If your home is burgled despite the fact you have CCTV, then your CCTV footage could be all you have in order to put the person who broke into your house behind bars. CCTV is a reliable source of evidence to use in court. Although obvious, this is often a security precaution that people often forget about, or people have lived in a friendly neighbourhood their entire lives and felt like they do not have to lock their doors – but you should never do this as it is an open invitation for criminals. Always lock your front doors and back doors to ensure that you have no easy entry for any potential robbers, if you are worried you may forget or are often busy then you could invest in door chimes. Door chimes make noises when the door is left unlocked or open for an extended period of time – to remind you to shut it. For extra security, you can also ask one of your local builders Newport Pagnell to secure your door frame into the brickwork of your house. When moving house, although you sign a declaration that states that you no longer have access to the building you can never always be sure. And if someone has a spare key to your property then they have free access to your privacy and all of your possessions. 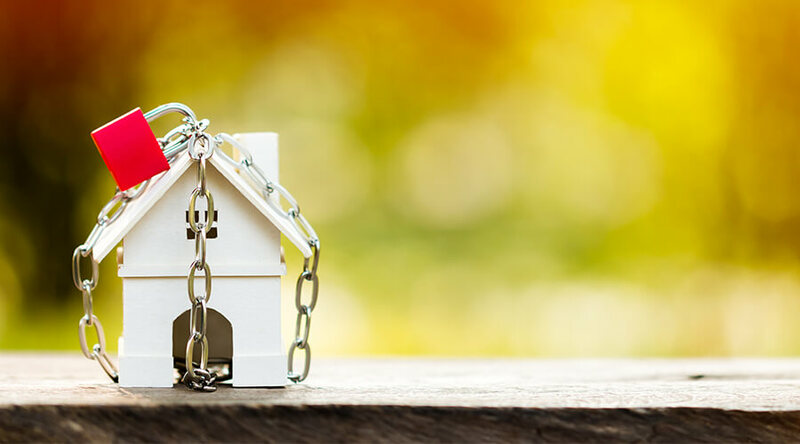 if you are worried about this, then you could consider purchasing a new build home or asking your local builders in Milton Keynes for pricings to build your own house – alternatively, you could simply have the locks on your home changed. The last thing you want is a dark driveway with lots of shrubbery and bushes that gives a thief a place to hide, keep your home entrance and back garden well lit so that if anyone does try to break into your home, they can be easily spotted and have nowhere to hide. Not only are dogs mans best friend but they’re also fantastic at home guarding and scaring off intruders. Signs showing that you have a large dog accompanied by a dog bowl or treats is often enough to deter a thief from your home. You do not necessarily need a large dog to scare off intruders, small dogs that bark will often be sufficient as they draw attention and can almost instantly alert owners. There have been plenty of stories of home owners coming home, and their dog has stopped an intruder I their home. So you can keep your home safe with these top tips, our local builders are most likely able to help you if there are more ways that you wish to make your home safer.